Replication is semiconservative: each DNA strand serves as a template for the synthesis of a new DNA molecule. Meselson and Stahl convincingly demonstrated that replication in E. coli is semiconservative. ...producing single-stranded templates for the synthesis of new DNA. A replication bubble forms, usually having a replication fork at each end. 12.4 Theta replication is a type of replication common in E. coli and other organisms possessing circular DNA. (Electron micrographs from Bernard Hint, Institut Suisse de Richerdies Experimental sur le Cancer). I Eventually two circular DNA molecules are produced. Conclusion: The products of theta replication are two circular DNA molecules. Replication is initiated by a break in one of the nucleotide strands. DNA synthesis begins at the 3' end of the broken strand; the inner strand is used as a template. 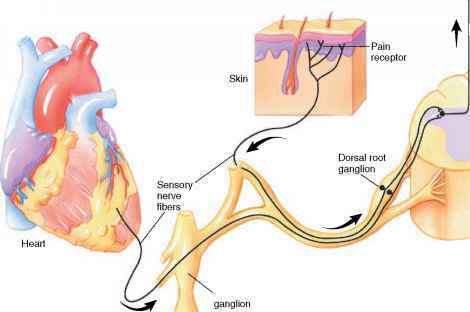 The 5' end of the broken strand is displaced. Cleavage releases a single-stranded linear DNA and a double-stranded circular DNA. The linear DNA may circularize and serve as a template for synthesis of a complementary strand. Conclusion: The products of rolling-circle replication are multiple circular DNA molecules. I 12.5 Rolling-circle replication takes place in some viruses and in the F factor of E. coli. nucleotide strands that then serve as templates on which new DNA can be synthesized. The unwinding of the double helix generates a loop, termed a replication bubble. Unwinding may be at one or both ends of the bubble, making it progressively larger. DNA replication on both of the template strands is simultaneous with unwinding. The point of unwinding, where the two single nucleotide strands separate from the double-stranded DNA helix, is called a replication fork. 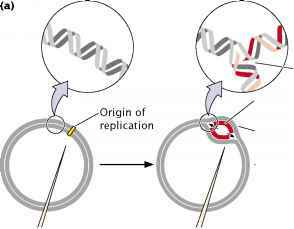 If there are two replication forks, one at each end of the replication bubble, the forks proceed outward in both directions in a process called bidirectional replication, simultaneously unwinding and replicating the DNA until they eventually meet. If a single replication fork is present, it proceeds around the entire circle to produce two complete circular DNA molecules, each consisting of one old and one new nucleotide strand. John Cairns provided the first visible evidence of theta replication in 1963 by growing bacteria in the presence of radioactive nucleotides. After replication, each DNA molecule consisted of one "hot" (radioactive) strand and one "cold" (nonradioactive) strand. Cairns isolated DNA from the bacteria after replication and placed it on an electron microscope grid, which was then covered with a photographic emulsion. Radioactivity present in the sample exposes the emulsion and produces a picture of the molecule (called an autoradiograph), similar to the way that light exposes a photographic film. Because the newly synthesized DNA contained radioactive nucleotides, Cairns was able to produce an electron micrograph of the replication process, similar to those shown in 4 Figure 12.4b. Chapter 8) of E. coli. This form of replication is initiated by a break in one of the nucleotide strands that creates a 3'-OH group and a 5'-phosphate group. New nucleotides are added to the 3' end of the broken strand, with the inner (unbroken) strand used as a template. As new nucleotides are added to the 3' end, the 5' end of the broken strand is displaced from the template, rolling out like thread being pulled off a spool. The 3' end grows around the circle, giving rise to the name rolling-circle model. The replication fork may continue around the circle a number of times, producing several linked copies of the same sequence. With each revolution around the circle, the growing 3' end displaces the nucleotide strand synthesized in the preceding revolution. Eventually, the linear DNA molecule is cleaved from the circle, resulting in a double-stranded circular DNA molecule and a single-stranded linear DNA molecule. The linear molecule circularizes either before or after serving as a template for the synthesis of a complementary strand.